I am happy to report that Sean seems to be well on the way to recovery! I, however, seem to be coming down with something that seems to have a striking number of symptoms in common with Sean’s illness. Ugh. This morning, we left for St. Mary’s Hospital bright and early. Our plan was to monitor the goings-on and come home in the early afternoon so that we could watch the playoff game between the Chicago Blackhawks and the Detroit Redwings. Chicago stunned us with another beautiful day, but sadly I had to keep my tender skin under the cover of clothing due to yesterday’s oversight. The sunlight and fresh air seemed to do Sean a world of good, though, since he’d been cooped up in our house for the last four days. Upon arrival, we almost instantly spotted an adult peregrine plucking prey near a vent at the top of the hospital’s south face. I handed Sean the camera and got my binoculars out, but the bird was too far away for either gadget to pick up much in the way of detail. While Sean took photos, I scanned the rest of the building for any sign of another adult or, better, a nesting site. Although I spotted a few reasonably appropriate nest ledges, I didn’t see any hint that they might be occupied. 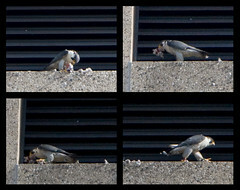 I focused back on the feeding adult just in time to see it pick up the remains of its meal and stomp down the narrow ledge with it. As the peregrine turned its back to us and busied itself doing something out of our sight, I noticed a few other clumps of feathers poking out of various locations in the large grate. My suspicions that this was a food cache seemed confirmed when the bird finished what it was doing and took off, leaving behind a new hunk of feathers stuffed snugly between the metal slats. The peregrine flew with purpose to the southeast and we soon lost sight of it. For the next hour or so, Sean and I wandered around the hospital grounds looking for any other occupation signs. Alas, we saw nothing. As for the adult, on a number of occasions we glimpsed it far in the distance, cruising the skies, but it didn’t come back to roost. We decided to have some breakfast at a nearby cafe where the outdoor seating area would allow me to keep watch on the hospital. By the end of the meal, I’d seen no new activity and decided to pack it in. Before we left, we stopped in to the hospital to use the restroom. I wandered over to the security station and chatted with the guard on duty for a little while. As it turned out, he knew the birds well! He told us that a number of people around the hospital watch the pair. Around April, they’d began seeing two birds with far more frequency and the number of bird bits and pieces on the ground around the base of the building had risen precipitously. One security guard had taken a special liking to the pair and had gotten into the habit of watching them via the security cameras on the roof. Wow! I gave the nice security guy my card and told him to feel free to give the information out so that any interested parties could contact me with information or questions (or leg band numbers). I haven’t heard from them yet, but I’m hoping they will make contact with me soon! It’d be great to talk with folks that are there every day. Who knows? Maybe they do have a nest there and I just couldn’t see it. Or maybe they use the hospital as a hunting perch but people see them haunting another nearby building as well. On our way home, we had time to check the pictures and were delighted to find a few in which a black over green band could be seen! So, at least we know the bird is banded. We stopped off at the garage on our way home from the ‘el, but neither jail bird was out and about. Drat! Can’t wait to hear from the St. Mary’s folks, though! ~ by Steph on May 17, 2009.